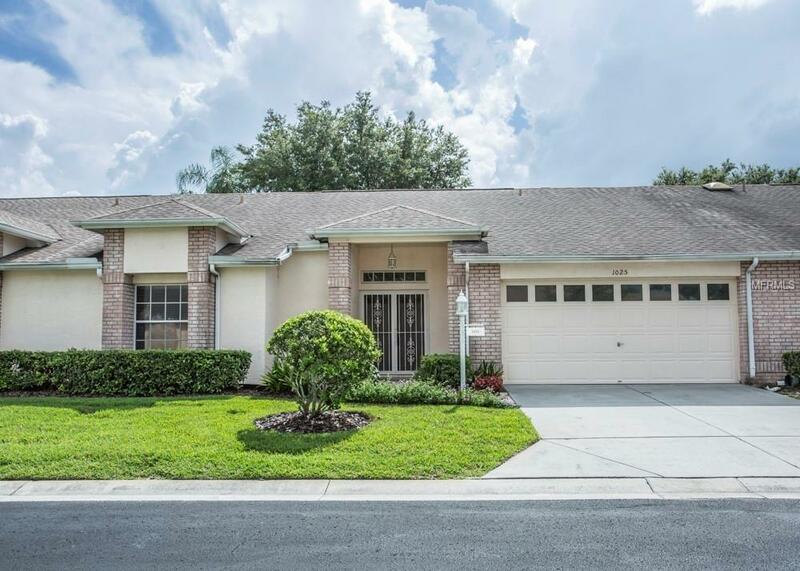 This 2 bedroom, 2 bath villa has stunning golf course and pond views. This bright and open villa features double door entry which opens to large living room/dining room combo with vaulted ceilings. A spacious family room features lots of natural light. Kitchen highlights include new stainless steel appliances, solid surface counters, closet pantry and eat in area with a bay window with a beautiful view of the golf course. Master bedroom has his and hers walk in closets, dual sinks, solid surface counters and walk in shower. The kitchen and both bathrooms have been freshly painted and both bathrooms have new light fixtures. Laminate wood flooring throughout all living areas including the bedrooms. Heritage Springs is an active community with a resort style clubhouse with a restaurant , bar, pool, spa, library, craft room and so much more. In addition there is a fitness room, tennis courts, golf and lots of social activities. Conveniently located in the Trinity area with nearby restaurants, shopping and medical facilities. Seller is offering a 1-year home warranty for buyers piece of mind!